Gone, it would seem, are the days of ‘Hello, My name is…’ stickers and Sharpies. Who wants a simple sticker on their chest, so flat and dull, when they can wear an entire computer, displaying their name and face in pixelated perfection? With this PiE-Ink Name Badge, maker Josh King has taken this simple means of identification and upgraded it. And in his Instructables tutorial, he explains exactly how. But here’s the TL;DR for those wanting to get the basic gist of the build. 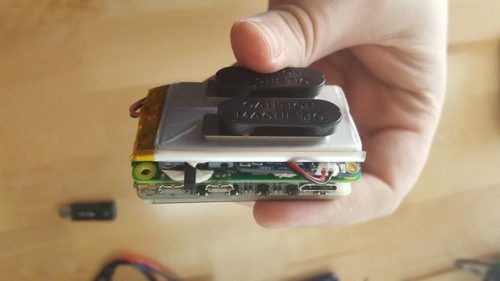 For the badge, Josh uses a Raspberry Pi Zero, a PaPiRus 2″ e-ink HAT, an Adafruit Powerboost 1000c, and a LiPo battery. He also uses various other components, such as magnets and adhesive putty. Josh prepped the Zero, soldering the header pins in place, and then attached the Powerboost, allowing the LiPo battery to power the unit and be charged at the same time. From there, he attaches the PaPiRus HAT and secures the whole thing with the putty, to ensure a snug fit. He also attaches a mini slide switch to allow an on/off function. 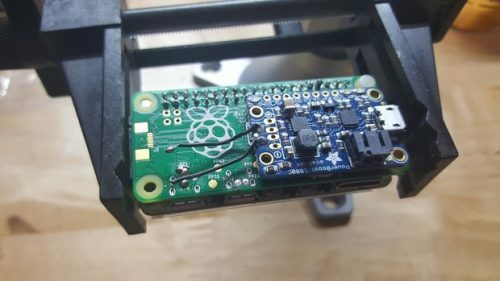 Having pre-installed Raspbian on the SD card, Josh follows the setup for the PaPiRus, ensuring all library information is in place and that the Pi recognises the 2″ screen. The code for the badge can then be downloaded directly from Josh’s GitHub account. You’ll need to scale your image down to 200×96 in order for it to fit on the e-ink screen. And there you have it. 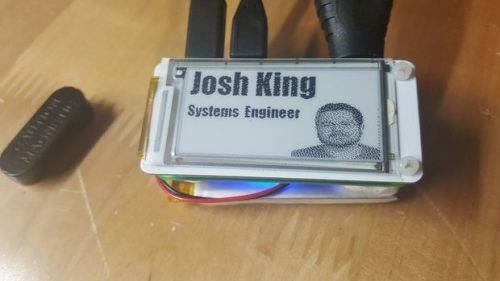 One Raspberry Pi Zero e-ink name badge, ready for you to show off at the next work function, conference, or when you visit Grandma and she still can’t get your name right. I have done a similar project, but a bit difference. My name badge consists of a Pi Zero, a Neosec 3.5″ TinyLCD35 3’5″ display (4080×320 resolution) and a 4Ah “powerbank” battery (good for about 15 hours on a charge). I create the badge image using LibreOffice and gimp, then display it using fbi. As with all things Pi, there are many different way to arrive at the same result. Now all it needs is a cool 3d-printed case. Please don’t poke fun at older people for a silly joke. It hurt a bit reading that as my family has a history of Alzheimer’s. I’ll step down from soap box now. @Zak While I sympathize with your family history of Alzheimer’s, I feel you may be being a little over sensitive. Nobody specifically mentioned Alzheimer’s. It was a harmless joke. In fact my grandfather regularly got his grand kids names wrong and he didn’t have Alzheimer’s. – one secretary of a Big Boss in a company I used to work for also called me “Stephen” when summoning me to meet the Big Boss. I was usually worried at this point in case I’d done something wrong. – my first forename is not “Stephen” nor “Steve” – that confuses official forms but helps identify junk mail. My Mother was christened Alice May; she hated it, and was known by everyone bar her mother as Alma. My wife was christened Heather Jane; she hated the Jane bit, and was known as Heather by everyone other than her parents, who called her Heather-Jane. I was christened John Andrew, Some people call me John, others call me Andrew, yet others Andy. Me, I call myself Confused. My wife’s name was Elinor, but she was Ellie growing up. She decided as an adult that she really wanted to be called Elinor, so that’s what I called her. She didn’t want me calling her Ellie, and didn’t want family and childhood friends calling her Elinor. Oh, and her sister’s husband was “grandfathered in” somehow to call her Ellie. So I’d go to family/friends gatherings with her where literally everyone except me addressed her as Ellie, but I, her husband, had to call her Elinor. Both are pretty names, both suited her, but the “one weird rule” was odd. I appreciate that the intent was harmless. Still, it did make me cry at work. It is a sensitive day. I don’t want to make it all about me, nor disagree with the awesome badge hack. Just point out a place where a bit of kindness could be extended… especially how the Pi community is the best group of people I’ve encountered, on the whole. I have two sisters. My Dad always cycles through all our names before settling on the correct one. One of the people I watch stream on twitch.tv mentioned her mother usually goes through all of her brother’s names before remembering hers. Pretty sure she doesn’t suffer Alzheimer’s. I found this article informative and thought-provoking, jokes and all. Thank you for your contribution. What are the magnets used for? So that the badge attaches to your body where the metal piecemaker is? If someone calls you the wrong name, it means they love you. Very nice. What a great idea and implementation. Too bad we can’t get e-ink displays the size of a Kindle. I can think of lots of possibilities. Keep your eyes peeled. We hope to be releasing 7″, 10″ and 12″ ePaper screens later this year. The only times i’ve seen a screen bigger than a kindle was the prototypes and that dual screen laptop/tablet. And other than the announcement eink did i haven’t seen a color display, so will be interesting! Hopefully going to be doing a KS around Q3 of this year, after fulfilling PiJuice KS and tying up a bunch of other loose ends that we need to tie up. We will make a lot of noise about it @PiSupply on twitter as soon as they are ready! The 12″ one is beautiful! Had an idea, with the small camera pimoroni just listed on their site for the zero you could take pictures and record the names of the people you meet. Add face recognition and voice control to recognize when someone is in view and you say “hello”. Would take the picture and record the audio with it of you saying hello so it ‘should’ capture their name too. I’m incredibly thrilled and honored to have you guys feature my humble little project on your website! Thank you so very much! If anyone has any questions, please feel free to ask and I’ll help to the best of my abilities. 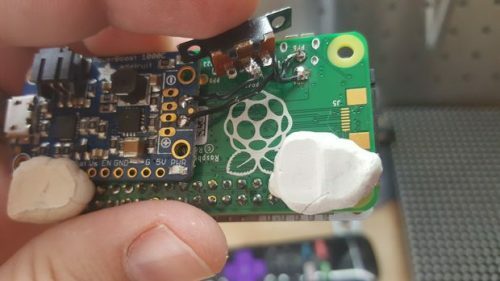 Shouldn’t the link for the ePaper be https://www.pi-supply.com/product/papirus-zero-epaper-screen-phat-pi-zero/. The link given is for the Pi 2/3 not the zero.